Job interview? 3 Tips to calm your nerves. I often work with people who have an interview coming up and want to prepare as well as possible for it. They come to me feeling that there is a lot at stake; the role they have applied for is key to their future plans; they pile the pressure on themselves and are fighting their nerves. Here are a few tips to work on before the interview which may help your preparation. 1 The feeling of nervousness sometimes creates physical reactions: Our muscles tighten, our heart rate rises, our blood pressure goes up and our breathing becomes shallow. You can correct this by practising this Deep Breathing Exercise. As you inhale through your nose, feel like you’re breathing way down into your stomach. As you inhale, put your hand on your stomach, and feel it expand. You should feel your stomach getting “fat” because you’re lowering your diaphragm. Make sure to keep your shoulders down as you inhale. Otherwise, you’re actually just breathing shallowly in your upper chest. Inhale for a slow count of five. As you exhale, feel like you’re sewing your rib cage together or like you’re pulling your navel into your spine. Exhale for a slow count of five also. 2 Know the people who will assess you. Try to find the names of the interviewers before the day of the interview, check them out on google, LinkedIn and / or their company profile and find out what their role in the company is; what their area of expertise is. Forewarned is forearmed, and you will feel more relaxed if you know who you are meeting. 3 Rehearse your body language. How to sit is different for a man and a woman: A man needs to keep a relaxed and open position, without crossed arms or legs and maintain a clear and steady gaze (without staring). A woman on the other hand can lightly cross her legs or ankles. Practice sitting, and leaning back in your chair. Then lean forward when you make an important point, or if you want to show you are actively listening. Practicing these three tips before your interview will make it easier for you to arrive at the interview in a calm state. and here is a bonus tip for you: Remember to smile! A smile will relax you and your interviewer. 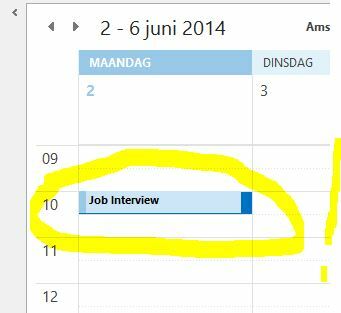 If you would like help in your preparation for an interview contact me on info@knowboundaries.nl to make an appointment.